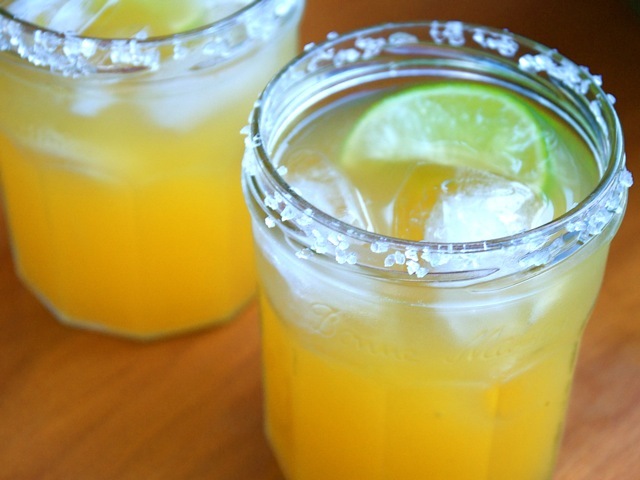 Agave nectar makes a tasty sweetener for margaritas, along with a splash of orange-flavored liqueur (I prefer Grand Marnier or Harlequin over Triple Sec). Squeeze the lime, the lemon half, and the orange half into a mixing vessel (a pint glass or Pyrex measuring cup). Add the shot of tequila, orange liqueur and agave nectar. Stir and taste. If it's too tart for your taste, add more agave nectar. Run the lime wedge around the rim of a bucket glass, then swirl the edge of the glass through a saucer of margarita or coarse salt. Fill the glass with ice and pour the drink into the glass. Drop the lime wedge into the glass and serve. To make several margaritas, follow the same proportions of citrus, alcohol, and sweetener.